Our anytime membership will allow you full access to the gym and classes at both Workout, Harbourside and Workout, Ashton, as well as a free induction (squash is not included in this membership). The harbourside club is situated on the historic cobbled Welsh Back road in Bristol city centre and originally opened in 1982 – it’s the longest-established independent gym in the city. At 17,000sq ft, Workout Harbourside is one of the largest city centre sites with four squash courts, a café and bar, a large cardio fitness room, a machine weights gym, two free weights and Olympic lifting rooms, a functional training area, a dedicated yoga/pilates studio, a spin studio and a large group exercise studio. The club has recently undergone a complete refurbishment and now has new top-of-the-range equipment – and the views from the gym and café areas overlooking Bristol’s famous harbourside cannot be beaten. We are very proud to have an outstanding reputation for our group fitness programme that is headed up by internationally recognised and Reebok-sponsored coach Kate Slee. We have some of the best group fitness instructors in the country and our classes are second to none. As well as our group fitness programme, we also have one of the best-known squash clubs in the UK, with a number of world-ranked players training here, including two of the very best – Red Bull-sponsored athlete Mohamed ElShorbagy and his brother Marwan, both top-10 players. 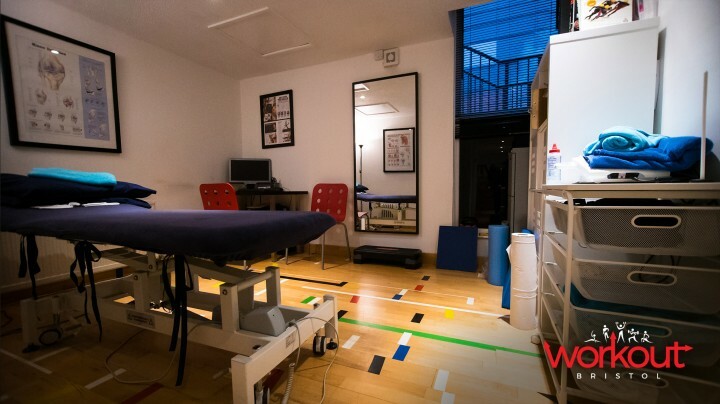 We also host Bristol Physiotherapy Clinic with an exceptional and experienced team who specialise in running and sports injuries. Book online now. The harbourside gym is situated on the historic cobbled Welsh Back road in Bristol city centre and originally opened in 1982 as Welshback Health & Rackets Club – it’s the longest-established independent gym in the city. At 17,000sq ft, Workout Harbourside is one of the largest city centre gyms boasting four squash courts, a café and bar, a large cardio fitness room, a machine weights gym, two free weights and Olympic lifting rooms, a functional training area, a dedicated yoga/pilates studio, a spin studio and a large group exercise studio. The gym has recently undergone a complete refurbishment and now has new top-of-the-range equipment – and the views from the gym and café areas overlooking Bristol’s famous harbourside cannot be beaten. We offer up to 60 free classes per week on our timetable, with the bulk of our classes following the Reebok Les Mills programming. Whatever your goals, we have a class for you, ranging from Grit, Body Pump, Body Combat, Body Balance and Body Attack to Body Step, RPM/Spin, yoga and pilates. All of our classes are specifically designed so that beginners and more advanced exercisers can take part in the same classes together. Here at Workout Harbourside not only do we have the best Squash facilities in Bristol, but we are also the home of multiple professional squash players including the world number 1 Mohamed El Shorbagy and women’s world number 4 Joelle King! We have 4 glass back squash courts with an adjacent viewing area. Whether you want to join one of our squash teams and compete in the local leagues or if just want to have a game against a friend we can accommodate you. At the club, we have one of the world's best coaching team 'Elite Squash', which is run by ex-professional squash player Hadrian Stiff and his team. Hadrian is also coach to the Ireland international team, the Shorbagy brothers and a number of other professional players. Elite Squash provides coaching for all levels and abilities as well as youth coaching and squash camps.